There are three UV light wavelength categories: UV-A, UV-B and UV-C. The natural UV-A and UV-B waves come from the sun and are often known as tanning rays. Their wavelengths are longer than UV- C and have no effect on bacteria or microorganisms. The UV-C wavelength is the germicidal wavelength and is rare on Earth because our atmosphere blocks it. UV-C utilizes short-wavelength ultraviolet rays and is harmful to microorganisms (shorter than UV-B and UV-A ) The DENAS Ultra offers a safe compact way to use disinfecting properties of UV light to protect you and your family from those germs and bacteria that cause illness. Proven, by Scientific studies, UV- C Light is effective in destroying nucleic acids and breaking apart germ DNA. When the germ or bacterias DNA is broken and destoyed, the germs, pathogens and bacterias can’t function or reproduce and the organism dies. 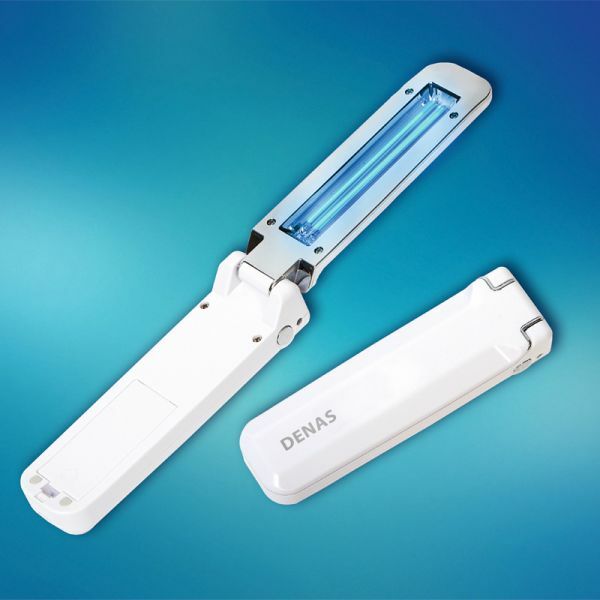 The energy of the DENAS Ultra’s ultraviolet rays penetrate through the cell walls of microorganisms and through absorption of their DNA, causing a disturbance of structure thus blocking the reproduction of bacteria, viruses and fungi. Through clinical studies scientist have discovered the most conductive effect on bacteria and viruses are shortwave UV radiation with wavelengths of 200-295nm also known as the germicidal range. This decontamination Unlike chemical disinfection methods does not impair the appearance and the functional characteristics of the disinfected surfaces without poisoning the air and does not cause allergic reactions. In addition, the DENAS Ultra easily destroys even those microorganisms that are immune to cleaning and disinfecting agents. The Denas Ultra is compact and easy to use. It operates using AA battery or USB cable. For disinfection of item or surface, turn the unit on and move slowly over the surface for 20-30 seconds. During this time, the ultraviolet radiation with a wavelength of 253.7 nanometers completely destroys 99.9% of harmful microorganisms. Use it around the home, in the car or while you are out shopping using those carts that 1000’s of others have touched. Protect your health from the bad bacteria and germs that cause illnesses. DENAS Ultra fits easily in your pocket, so you can always have it on hand, even on a trip around the world. Compact, portable and easy to use will give you peace of mind when you need it. Successful companies like Denas Pain Relief Store are built one customer at a time, by providing unmatched customer service and support. 100% Satisfaction Guaranteed has created repeat business from our customers. So, when it’s time to purchase DENAS products remember that Denas Pain Relief Store offers you 10 Reasons To Shop with us including Free Lifetime Training & Support that gives you Peace of Mind and personalized service that fits your NEEDS and BUDGET.